"Well maintained 2/2, furnished. High vaulted ceilings! Great location!" Address: 401 Knotwood. Furnished, great view from lanai! 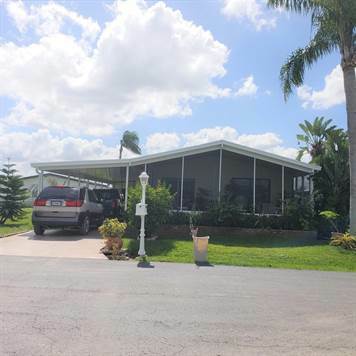 Very nice 2/2 manufactured home in Naples Estates, a 55 and up age restricted community. Lot rent for this home is $745.50 per month which includes water, sewer, garbage pickup and use of all amenities. Two pets are permitted per home with some breeds of dogs prohibited. Park approval is required by all residents to purchase. Naples Estates has so much going on - new state of the art resort style ballroom and activity center, fitness center, large pool with spa treatment, new bocce ball courts, pickle ball courts, 18 hole miniature golf course, dog parks and more! Not only is this community close to shopping, public golf course, movie theaters, restaurants, and banks, it is only minutes to beautiful historic downtown Naples 5th Ave. and 3rd Street shopping district and our beautiful white sandy beaches! This home has been well maintained and is move in ready! The open floor plan has a spacious living room and adjacent dining room. The kitchen has lots of cupboards and counter space and a pass through is open to the dining room. The flat top stove and large double stainless steel sink makes this a very user friendly kitchen. Just outside the kitchen near the entry door is a stacking washer and dryer - no need to go outside! The large master bedroom has a queen size bed, chest of drawers and dresser, nightstands, and a large walk in closet. The private master bathroom has a nice size double door walk in shower, linen closet, and vanity. The guest bedroom is just across the hall from the master bedroom with a king size bed, large double door closet, dresser and desk. In the front of the homes through the double sliding glass doors is a large 10 x 22, new screened in lanai. Also new is the very long carport - enough room for 3 or 4 vehicles. At the back of the carport is an 8 x 8 shed which also has a washer and dryer hookup. The a/c heat pump is only 4 years old! This home is in great shape, ready for seasonal or full time use! For more information or to schedule an appointment, please contact me. ▪ Well maintained 2/2 home, mostly furnished. Great location, minutes to historic downtown Naples, beaches, boat launch facilities, and public golf course.